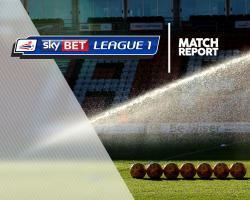 Sheffield United extended their unbeaten Sky Bet League One run to 11 games by beating managerless MK Dons 2-1. Stefan Scougall was the star of the show for the Blades as he scored the first and then set up Billy Sharp's second-half winner, which meant the Dons' life after Karl Robinson ended in defeat. The tone was set in just the fifth minute when Scougall swept home from eight yards following good work by John Fleck from a recycled corner. Chris Wilder's men had further chances to go in front but Daniel Lafferty headed wide and Fleck could not keep a low shot on target. And that allowed the Dons, under the caretaker stewardship of Richie Barker following Robinson's exit earlier in the week, to get back in the game as they levelled in the 49th minute when Darren Potter drilled home from the edge of the area. But the Blades are a different breed under Wilder this season and they won it midway through the second half when Sharp finished from close range after fine work from Scougall on the byline.